Tom King's Batman: Should We Keep Reading? By Zack Quaintance — I got a call the other day from a friend, asking if I planned to keep reading Tom King’s current run on Batman. The series is currently on #58 (out this week) of what King has said will be 104 total issues. To be quite frank, before that call I hadn’t even considered quitting. So, the question caught me off guard. My friend had also previously written about King’s work, heaping praise upon it. Yet, there he was, ambivalent about continuing. Something has changed with this Batman comic. Maybe it was the wedding, hyped by many (from DC marketing to the creators) as a pivotal moment in the long history of a classic character, until...it wasn’t. But no, that’s not it, The Cold Days arc that followed (in which Bruce Wayne finagles his way onto a jury to successfully make a case that his alter ego is flawed) was one of the best Batman stories in many, many years. Well then, maybe it was that recent KGBeast arc? After all, Nightwing was shot in the head for some reason, which I guess was maybe kind of justified by Bruce and the aforementioned Beast having liked the same gross children’s book as kids? I don’t know. The whole thing felt a little disturbing, mostly based on (excuse the pun) the execution (although I did love Batman #54, which preceded it). This shot in the head thing, however, has been worse for the current Nightwing comic (they ran off Ben Percy! ), than it has been for Batman. 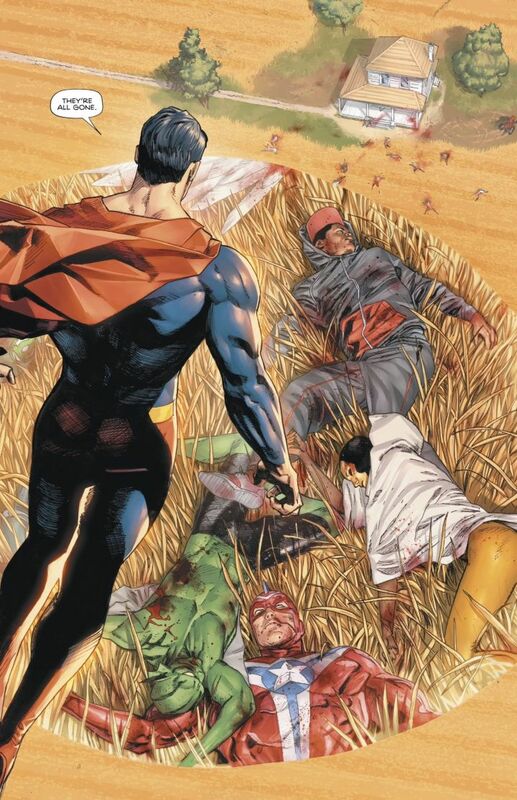 The gritty themes in Heroes in Crisis have some readers wondering if DC has given up on the hope that made Rebirth popular. Or maybe the reason was and continues to be Heroes in Crisis? The mini-series has, after all, upset many fans (perhaps purposefully), brutally murdering beloved and long-tenured characters in swift and unceremonious fashion, one of which (Wally West) was a pretty literal embodiment of the hope that defined the publisher’s most recent line-wide shakeup, Rebirth. I think that last one is having a bit of an impact on readers, so let’s talk about it. Heroes in Crisis is a 9-part series purported to be a combination of commentary on an American PTSD epidemic resulting from the war on terror, plus also a murder mystery starring superheroes. Two issues in, it’s been utterly grim and fairly cold, literally slaughtering and autopsy-ing several young characters. It also seems to be indicative of a larger grim turn for a publisher that had its biggest success this decade with Rebirth, which, again, was built on hope. Heroes in Crisis, in other words, hasn’t been a crowd pleaser, and Tom King is the one behind it. I’m still hearing the majority of readers (both online and off) say things like This is Tom freaking King, he knows what he’s doing, but for others, confidence in King’s ability to deliver has been slightly rattled. Meanwhile, King is also a writer whose style often feels non-conventional, relying as it does on voice-heavy tricks such as repetition of key words or phrases to re-enforce meaning, novel uses of form and structure, and quotations from poems and literature. These are all things that really standout in today’s corporate superhero comics malaise, which is part of what helped King so quickly rise to prominence. The flip-side to all of that, however, is that stylistic flourishes tend to yield diminishing returns. The poetic quotations in King’s breakout 2015 series The Vision, for example, landed much harder for me than those in this week’s Batman #58. Batman, it should be noted, is a twice monthly title on a white-knuckle creative schedule, and so, really, it’s hard to fault King for going back to some of his most trusted tools here and there. Overall, I’ve liked King’s run, with the highlights for me being the double date issue (Clark/Lois, Bruce/Selena), the much-loved and Eisner Award-winning Batman Annual #2 (Rooftops), and the recent Cold Days arc, wherein Bruce Wayne finagles his way onto a jury and makes a case that his own alter ego is flawed (a premise so nice I rehashed it twice…sorry). And on the whole, I’m still enjoying this comic’s writing. I have a bit of Batman fatigue, but I’ve had that for at least a decade and yet still I soldier on. Could Tom King’s Batman run be a direct play on the classic Knightfall storyline? To me, King is engaged in a deep character study, taking apart and rebuilding Batman in an in-depth way not attempted since Knightfall. In fact, my deep suspicion here is actually that what King is trying to do with his 104-issue run is craft Knightfall for a new generation, creating a sequel of sorts in which primary villain Bane takes a less-overt and more-cerebral approach to breaking The Bat. And if that’s the case, I’m there for it. In the original early ‘90s Knightfall, Bane weaponizes Batman’s rogues gallery against him by freeing them all from Arkham and laying back as they exhaust the Cape Crusader, pushing Bruce to place of shaken weakness after he spends several sleepless days rounding them all up. Afterwards, Bane storms Wayne Manor/The Bat Cave, and literally breaks Bruce’s back over his knee. Why? Because he wanted to prove that he could and because, of course, he’s evil. After the failed wedding, we learn Bane has returned to his old tricks and is trying to once again break The Bat, perhaps as revenge for an earlier story arc and all the other indiginities he’s suffered through the years at the hands of Batman. Here’s where this sequel idea really becomes interesting to me. Bane’s efforts are evolved, more subtle and more cerebral than the last time he gave it his all. He’s now manipulating Bat foes into having direct incentives to complicate and terrorize Batman, be it KGBeast’s assassination attempt of Nightwing, or Catwoman being guilted into leaving Bruce at the altar. My guess is that this all could lead up to another (or different) broken back scene soon. I find this intriguing because it strikes me as an essential update on the Knightfall story for our times. Knightfall was published in the early ‘90s, when real world foes, like Bane, were more overt. The Soviet Union had just fallen, but for years prior we’d known them as our rival, our enemy. We’d watched out for their machinations. These days, however, we seem to be involved in a Cold War sequel, rife with speculation about what Russia may or may not be doing to move against us, as well as tertiary and internal actors seemingly being motivated to aid their cause. Casting Bane as a similarly-improved tactician is sharp and heady stuff. If that kind of metaphor is what King’s engaged in here—phew, count me in, I’d like to see where it’s all going, even if Heroes in Crisis continues to land with a thud (although I’m still hopeful that there’s something larger in play there than the first two issues would suggest…). Moreover, even with King’s style becoming more familiar, it continues to stand out as a smarter approach to the work. The meaning isn’t always as powerful as it was in his early superhero books, but King is still on a marquee title and trying something new, an increasing rarity in this age of editorial oversight and careful guarding of would-be billion dollar movie franchises. I think that entitles him to a slightly longer rope, one I’m still personally happy to afford him. Check out more of our analytical writing on comics. New edition every Monday morning.